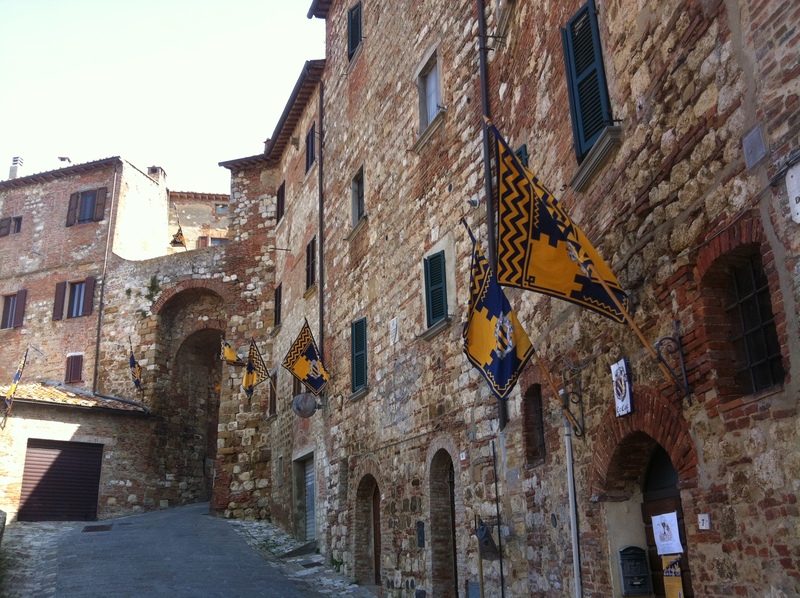 Bravio delle Botti is an annual happening in Montepulciano, the last week of August. Bravio is perhaps little less known than the other local happening, Palio of Siena, but definitely not less entertaining. Bravio has it origins in 14th century. It used to be a horse race, very similar to the one in Siena. It was created as a folkloristic celebration of the towns patron, San Giovanni Decollato. The race between the towns eight districts (also called contrade). 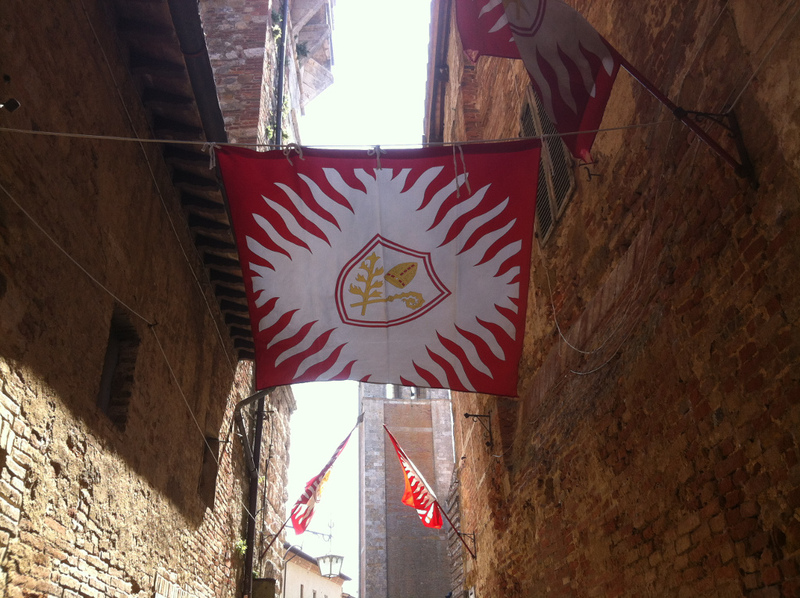 Each contrada has their contestants, who are cheered with certain coloured flags. The bravio as a horse race was brought to an end in 17th century, probably due to civil order. It was brought back as late as 1974, by a local parish priest Marcello del Balio, who wanted to bring back the ancient celebration, replacing the horses with man power and setting in focus the true value of Montepulciano, the wine! The word bravio comes from the word ‘premiation’ and has to do with a competition. 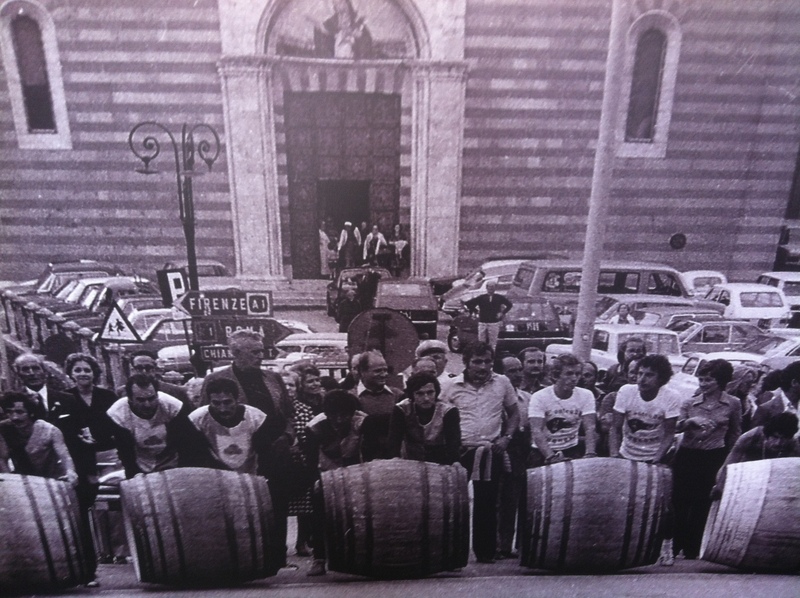 Each of the eight contrade (districts) of the town, have their team of 2 ‘spingitori’,’ barrel pushers’, who will roll a wine barrel, that weights 80 kg, across the towns streets. The race begins from Piazza Savonarola, in front of Hotel Marzocco. Continues all the way through the town until the Duomo, the dome at Piazza Grande, approx. 1800 m. The race is hectic, there is not time to rest along the way, everybody who has been to Montepulciano, knows how steep the streets are! The winning team gets a valuable colourful cloth, painted by a local art students, that honours the towns patron. The preparations begin week before, there are rehearsals and lovely local happenings in town the week of the Bravio. 10.30 – 16.30: Opening of the week of bravio. Town administration will officially open the event. Music and happenings. 21.30 – 22.00: Historical procession along the streets, all the way up to Piazza Grande. This year there are organised special happenings to celebrate 40 years of bravio. (1974 – 2014). Sunday week before the bravio: 16.00. Piazza Grande. The ‘ann’ the painted clothing that the winning team gets, is presented at Piazza Duomo. There are also other local happenings, premiation of local restaurants and wine makers. Last Thursday of August: 21.15: The town lights will be shut down, so that the historical procession with candle carriers can begin. Candle carriers, tamburine players, flaggers and finally also towns main flag is brought from the town hall, in a historical procession, from different directions, all to finally reach Piazza Grande, the main square. The evening is filled with other happenings, that vary from year to year, but always celebrate the town, the medieval traditions and the bravio. The evening ends with fire works at midnight. Last Sunday in August: Bravio delle Botti – Let the races begin! 10.00:Piazza Grande. The day begins with the estraction of the starting order. The happening is created with firemaerkers, tamburines and other medieval figures. Then blessing of the players and the cloth by the bishop. 13.00: Players and cheerers unite enjoying a lunch in their own ‘contrade’. These open air ‘street restaurants’ are open for public, and offer great food for reasonable prices. Join your favourite team for a lunch before the bravio! 15.00: Magnificent historical procession, with over 300 medieval figures, flaggers, tambourine players, noble ladies and cavaliers, there is a competition for the best medieval couple among the contrade. Vote your favourite! 19.00: let the games begin and the wine barrels to roll! The races begin in Piazza Savonarola, in front of Hotel Marzocco, the racers are proceeded by a safety car, make the first steep uphill along via Gracciano, then continue towards Via Collazzi and finally up Via Ricci all the way to the Dome, where the arrival is and cheering crowds are waiting for the winning team. Each year the celebrations are expected to continue until late night. Bravio delle botti today is about celebrating the local spirit, the excellent products and cherishing the popular local traditions with the local people as well as the travelers. There is a wide range of culinary happenings, street food and the local restaurants and wineries set out their best ‘popular’ offers during the week of Bravio. It is free to follow the bravio and the processions along the streets, the happening at Piazza Grande are on payment, € 6,00-10,00.